Traditional business intelligence (BI) solutions were designed with data analysts in mind. They were and remain to be heavily technical to use; there’s a drawn out process to take a question from a business user and get that question answered in a helpful data visualization and report. Now, thanks in large part to AI, natural language programming, and machine learning algorithms, there is a new wave of BI platforms that fall under the umbrella of modern business intelligence. This newer software has already proven to be game changing across industries, especially at the enterprise level, and the consumer packaged goods (CPG) space is no exception. Consumer packaged goods companies (CPGs) face a number of challenges ranging from changing demographics to evolving shopping preferences to the rise of omni-channel competition. In reaction to these challenges and many more, forward-thinking CPGs are investing in analytics platforms that give them a winning edge. What are these “winning” business intelligence solutions, and how do they solve common CPG challenges? The tools have continually developed in recent years, and the most advanced platforms currently are self-service, augmented analytics solutions. Self-service, as the name implies, refers to the fact that business users can go directly to the platform with their questions, speeding up the process and keeping data scientists free to explore deeper queries. Augmented analytics speaks to the insights potential of modern business intelligence solutions. Using machine learning and natural-language processing, advanced BI software automates the insights process and drives higher-level analysis of company and syndicated data. Given those features, it is not difficult to see how a self-service, augmented solution could solve a number of analytics challenges that CPGs (also referred to as FMCGs) face. Click any of the links above to jump directly to that section; otherwise, scroll down to begin reading the complete article. 1. 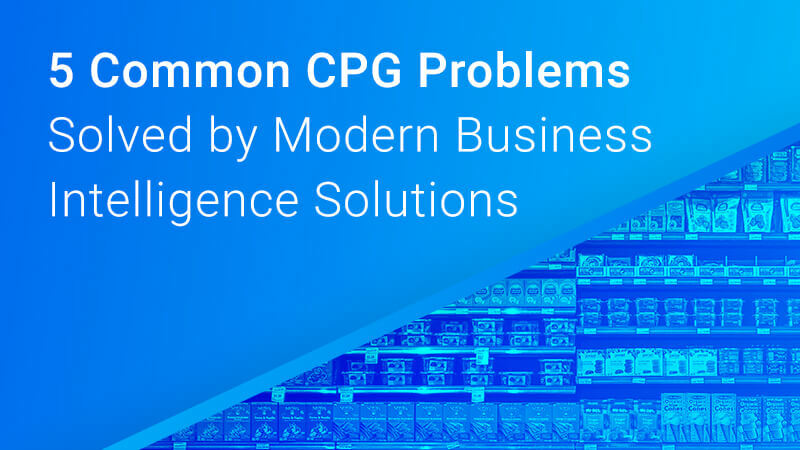 CPGs deal with a high volume of stores, channels, and customers, causing increased decision complexity. Modern business intelligence solutions will help you perform those assessments and identify those growth opportunities. Essentially, organizations have locked in on what advanced analytics solutions can do, and they are ready to start to take full advantage. Thanks to omni-channel distribution and changes in consumer behavior, every CPG leader needs to be focused on the concept-based and software-based objectives highlighted in the Dresner study. There is a three-part modern BI advantage for fast-moving consumer goods (FMCG) companies dealing with this particular challenge. Forward-thinking analytics platforms will let CPGs access internal and syndicated data simultaneously, so they can get a complete picture of the what the diverse data sets are pointing to. In turn, self-service platforms empower business users to go directly to the data with their questions rather than the analytics department. And finally, that same platform can offer automated insights to encourage deeper thinking. The core takeaway here is simple. When your consumer goods company combines the collective brainpower of your team with the machine power of a modern business intelligence solution, you can get a step ahead of the competition. 2. FMCGs cannot accurately forecast brand and product performance. It’s nearly impossible to plan and strategize if you have no true sense of what the future of your products and brands holds. Today’s rapidly-changing climate, especially, requires an in-depth understanding of CPG industry trends. Syndicated data sources likely have the most comprehensive overlook into the direction of the market, but finding an analytics solution with streamlined access can be a challenge in its own right. Plus, as the CPG industry trends toward e-commerce and omnichannel marketing, data is flowing from more touchpoints. Since the sheer volume of data available to your team continues to grow, an inability to accurately forecast can be acutely frustrating. On the one hand, you know the answers you’re looking for are within the data. On the other hand, you’re being held back by dated technology and systems. Success feels just out of reach. The right analytics solution can close the gap. Take on a solution that provides insights alongside every question you ask, all while empowering your team to make cross-departmental decisions. Imagine how much progress you’d make if your business users (like CMOs, category managers, and brand managers) could almost immediately get answers to questions around overall brand performance — and then use those answers as a launching point to go deeper into why your brand is performing in a certain way. Modern business intelligence software, like AnswerRocket, gives non-technical users the freedom to do just that. Plus, with advanced AI-powered solutions, business intelligence tools can analyze combinations and relationships between your data, calculating growth opportunities that can poise your team toward a future-thinking strategy. Often, asking questions can be a reactive process that puts your team in the position of playing catch-up. The value of rethinking this approach to FMCG analytics is not just about increasing efficiency; it’s about intertwining the process of asking questions with setting strategy, so that your team can take a more organic, informed, and data-driven approach. 3. The timeline CPGs face to get data and insights is lengthy and inefficient. In a landscape as competitive as the CPG industry, every inefficiency matters. When valuable strategizing and decision making are held up by a slow reporting process, your company loses money. It’s as simple as that. The process of using a traditional BI solution is way too arduous and time consuming. The business user brings that question to your analytics team. The query gets added to the queue. An analyst produces a report on the question in approximately a week (turnaround time can vary widely). The report is helpful and actionable. The business user has already moved on to a different train of thought. The business user has follow-up questions and needs to submit new queries to the analytics team. Sound familiar? The sad truth is, the second and third outcomes listed (b and c) occur more often than not. Investigative thought and strategic planning flow organically, and they cannot be accurately addressed and condensed into a single question and single report. You need the flexibility to ask a question of your data, see the results, and iterate and ideate from there. With a self-service solution, you’re looking at eliminating steps 2-4. Your business user can go straight to the data. Once their answer is generated, usually in a matter of seconds, they can go further by digging into the natural language insights that advanced augmented analytics platforms now provide. This direct-access approach saves time by cutting out report wait times, and it allows for deeper, more accurate individual research, because the person asking the questions gets to be the one to lead the investigation. 4. Actionable insights are hard to come by. As mentioned in the above section, insights capabilities are the newest frontier of business intelligence software. With an insights-capable platform, the real work begins once an answer is generated. Along with the answer, forward-thinking platforms will also provide key takeaways and actionable insights in a written, natural language support document. Interpretation of analytical results is eased … by automatically-generated textual narratives. More than one vendor of “natural language generation” software can create a paragraph or so of interpretive text about a particular bit of descriptive analytics. It is early days for this technology, but some viewers and decision-makers may find text easier to interpret than bar and line charts. What’s great about this software feature is that your team’s analytical starting point is 10 steps ahead of the competition. For example, an AI-powered solution enables a business user to ask a natural language question like ‘sales by month and manufacturer’ and then automatically generates insights that can act as a starting point for a business strategy discussion. Specifically, these insights immediately pinpoint details such as the manufacturers with the largest sales increase and the greatest decline. These interesting trends can inspire the business user to further ask questions to determine why this is the case. Think of it this way: if your launching point for strategy and decision-making is a thorough data investigation with comprehensive, insights-driven reporting, your CPG will begin the conversation at a level that is arguably deeper than your closest competitor will even reach. 5. Business users have limited data and analytics access. For most companies, “state-of-the-art” data analytics means having technical specialists create dashboards that try to anticipate business users’ questions. But the truth is, they can only anticipate some. And each day the business changes, generating new questions. These questions then require more technical help to create new reports, which may take weeks to produce. That’s an eternity in today’s competitive environment. Of course, time is a vital component in this whole process (it’s covered in the third section of this article). However, it is important to also acknowledge the “outsourcing” aspect of the question handoff that occurs in the process detailed here. You only have surface-level analysis. For business users: They have to boil a concept and theory down to a concise query to request. There’s no room for ongoing iteration. For data scientists: They are not given a complete window in the business user’s mindset and conversations. They are working with limited information and providing the best report that they can within those constraints. Curiosity is stifled and deeper analysis halts. For business users: First, if the process of generating a report is difficult and inefficient, chances are, your business users are going to avoid the process altogether. Second, if a user does go through the arduous analytics process, they are not likely to revisit it, even if they have valid follow-up theories and questions. For data scientists: Imagine a world in which your data scientists are not running basic queries for your business users. Instead, they’re empowered to use their expertise to dig even further and generate more advanced dashboards and reports than previously thought possible. Your CPG will not get there without the help of a self-service, augmented analytics solution that can bear some of the responsibility currently falling to your data science group. This is not the fault of your business users or your data scientists but rather, inefficiencies in the process. No one is positioned to perform a thorough and useful analysis. Business users have to boil their idea down to one question for the data science team, and data scientists have to generate their reports in a vacuum without interprocess feedback opportunities. Let technology step in and make things easier. Outside the scope of self-service analysis, look for an analytics solution that democratizes data in much the same way it democratizes the data analysis process. In other words, opt for an analytics solution that empowers citizen data science. Find a platform that will let you execute critical cross-departmental analysis such as your CMO having easy access to sales dashboards. Additionally, for a thorough competitor analysis, you’ll want a platform that pulls from internal data and syndicated data. To sum up, when it comes to your data, you want to democratize, democratize, democratize. Make sure you are working from a comprehensive dataset that all relevant users have easy access to. Given the current analytics marketplace, there is no excuse for a siloed, segmented approach to analytics.